​Emotional Freedom Techniques is a form of counselling intervention that draws on various theories of alternative medicine including acupuncture, neuro-linguistic programming, energy medicine, and Thought Field Therapy. It is best known through Gary Craig's EFT Handbook, published in the late 1990s, and related books and workshops by a variety of teachers. Often referred to as "Psychological acupressure", the technique works by releasing blockages within the energy system which are the source of emotional intensity and discomfort. These blockages in our energy system, in addition to challenging us emotionally, often lead to limiting beliefs and behaviours and an inability to live life harmoniously. ​The theory of EFT is that negative emotions/experiences can cause disturbances in the body's energy field. In essence, EFT is an emotional version of acupuncture wherein we stimulate certain meridian points by tapping on them with our fingertips. ​EFT is a common sense approach that draws its power from Eastern discoveries that have been around for over 5,000 years. In fact Albert Einstein also told us back in the 1920's that everything (including our bodies) is composed of energy. 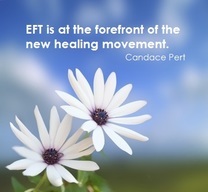 ​EFT can often reduce the timeline of the therapeutic process significantly. At times life changing shifts can occur within a session rather than months or years of counselling. Emotional stress can contribute to pain, disease and physical ailments. We often find that EFT provides astonishing physical relief in a relatively short time. ​Negative emotional experiences disrupt the energy meridians that run through our body. The physical changes we feel from those disruptions become attached to the memory of that experience and affect the way we see the world…until we heal or process that disruption or experience.